You are here: Don't Waste The Crumbs » Save on Groceries » How much should I spend on food? How much should I spend on food? But it’s a legitimate question, especially when you’re first transitioning to eating real food and are new to budgeting. You should not compare your own grocery budget to someone else’s. This is important, because I don’t want you to think that just because my grocery budget is $330/month that yours should be too. Or when you see a Facebook update that “this family of 10 feeds their family on $100/month” or whatever, you think you should be doing that too. Comparing yourself to how others are doing will only lead to feeling defeated and inadequate. Ignore those comments and focus on your family and your budget instead. Your goal should always be to do the best that you can do with what you have. 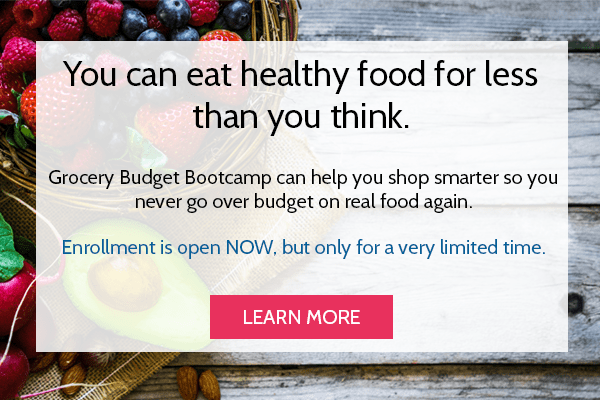 Your food budget will be unique to YOUR family and YOUR situation and YOUR dietary needs and where YOU live and the stores close to YOU and the types of food that YOU like to buy. Just like every snowflake is different, every grocery budget is different. Embrace YOURS. We had paid off our debt (minus the car) at this point, so the rest of our income was divided between tithing and savings. When we were in pay-off-debt mode, a very large portion of what was left went to that. Coming up with our $400 grocery budget wasn’t some stroke of genius. We simply tallied up what we normally spent on food and said we wouldn’t go any higher. This is just one way to create a budget though, and it might not be the best way for you to create one. Use the scenarios below as guidelines to help determine how much YOU should spend on food. Note: These scenarios are based on the assumption that all meals and snacks are prepared at home. It does NOT include the cost of eating out. Every month the United States Department of Agriculture (USDA) publishes a report with what they think the average cost of food is for families of various ages and sizes. They break it down into four plans: Thrifty Plan, Low-cost Plan, Moderate-cost Plan and Liberal Plan. If your family has less than or more than 4 people, or if you want to know specifics for ages and genders, the report gets pretty granular. Use the most recent report to get specifics for your family. Several major reports and studies found that the average American spends between 7.5% and 10% of their household income on food (according to the Bureau of Labor and Statistics). Of all the scenarios, this one is the most important because your food budget depends on how much money you make. A blogging colleague once said that the food you buy does not determine your grocery budget and I couldn’t agree more. If our grocery budget is based on the quality of food we buy, we have it backwards. It’s entirely contradictory to the basic rules of budgeting. It’s like saying because you want to buy a nice big new house, you need to have a bigger paycheck. But that’s not how it works. We start with the paycheck first, and THEN we see what kind of house we can afford. The same goes for grocery budgeting. We start with the money we have, and THEN see what quality of food we can afford. These reasons, among others, is why when someone asks how to afford organic food on a budget, my first piece of advice is to create a grocery budget (here’s how to do that). If you don’t like the answer and want to be able to spend more money on quality food, then find ways to save money elsewhere and put more funds towards your grocery budget. When we first created our grocery budget, I didn’t garden nor cook much from scratch. I shopped almost exclusively at Walmart, my oldest child wasn’t even 2 and my youngest was nursing. I didn’t know anything about real food and distinctly remember buying 4 boxes of blueberry Eggo waffles at the beginning of every month for the next 4 weeks of daily breakfasts. All of these things contribute to our $400 budget at the time, which was about 12% of our take-home income, putting us in between the USDA’s thrifty and low-cost plan at the time. Fast forward to today and we are blessed to not have any food allergies or restrictions. I don’t currently garden but I cook 99% of what we eat from scratch. I shop Aldi, Costco and Walmart on occasion, and buy certain things online when I know it’s the better deal. We also eat some organic foods, shop the farmers market and in the past, have been subscribed to a local CSA. My kids are currently 6 and 8 and while they’re not teenagers eating me out of house and home, they eat more than they did six years ago. All these things contribute to our current grocery budget of $330/month, which is oddly less than what it used to be. If you’re happy with what you spend on food and don’t want to change anything, then pat yourself on the back. That’s a great accomplishment! If you’re not happy with what you spend on food, want to start spending less OR want to increase the budget so you can spend more money on quality food, it’s time to start trimming expenses elsewhere. Remember that how much you spend on food now is not set in stone forever. You can work really hard to get it as low as possible so you can save for a house, a new car or boost your emergency fund. You might also have to increase it as your family grows or the needs of your family changes. In either case, the starting point is knowing how much you should spend on food! 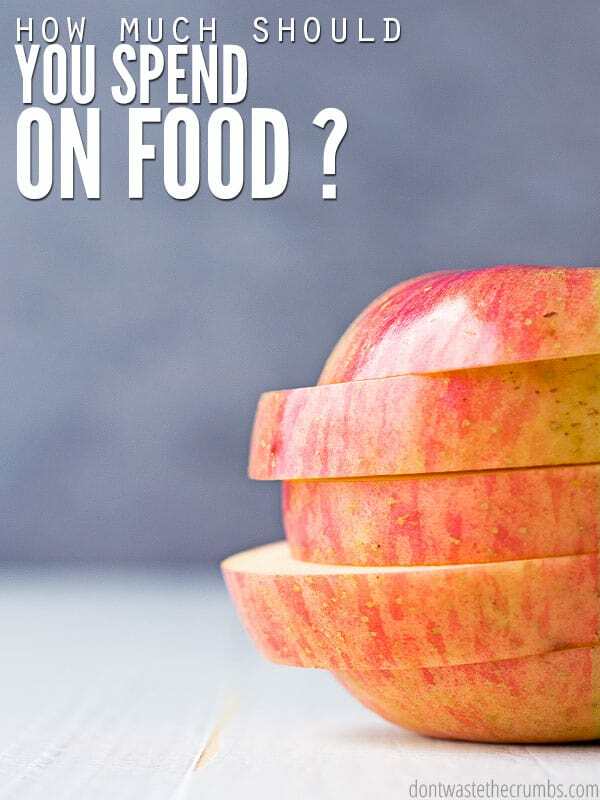 Answer me this – how much do YOU think you should be spending on food? This is interesting…according to the math, we spend about 15% of our income on food, and I’ve trimmed and saved just about everywhere. (We live in a really remote area, so some of our shopping choices/options are limited). Even still, we are below The USDA Thrifty Plan for our family. So I guess that’s good?? Our budget has adapted by cutting in other areas, but it’s interesting how the actual percentage works out. I have struggled with this for years – – – I always feel like I can be doing better with our food budget, and I have a hard time finding comparisons with other families because I have 11 children – ages newborn to 15. There are 12 of us who are eating. 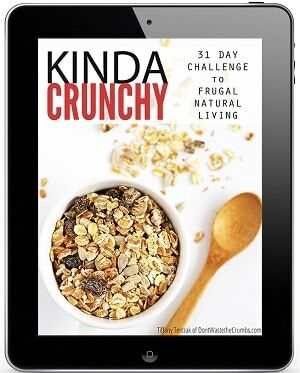 It’s a constant balance of finding food that is frugal, easy to prepare, tasty, healthy, etc. and I have no model for comparison. Growing up, there were only 4 of us in our family, and what my mom served is vastly different from the meals I prepare for my own family today. I’m always unsure of myself . . . it’s been trial and error as our family has grown! Finally, I calculated the USDA plans for our family, and then I tracked a few months with my receipts on our spending. I found that we’re consistently below the thrifty plan each month – without making any adjustments. So, I was doing better than I had thought. That was a good reality check for me. That’s amazing Kristin! I’m actually more impressed that you’re cooking healthy food for a family of 12 more than your budget! Sending you serious virtual pats on the back!! I, too, am feeding a family of 12. We have 10 kids from 3-21 years old. I have been budgeting for years (use the envelope system and swear by it!) and can feed the family for $1200 per month including buying a whiole steer every other year at a local livestock auction (the meat lasts us two years as it is double wrapped with paper-wrapped bones and then vacuum sealed by the butcher). No, meat isn’t cheaper to buy this way when you figure the per-pound price, but it is well worth it for a safe meat supply for our family. We don’t have an Aldi out here yet but am looking forward to one opening soon. I should add that we live in San Diego, where everything costs more, so we are doing pretty well with that budget for where we live. Eggs have been nearly $3.00 a dozen and milk is $2.89 per gallon and we go through about 10 gallons of milk a week. I hear ya’, Wendy! We do a lot of the same things. Since moving out of the suburbs to rural acreage, we’ve found so many blessings in having our own flock of chickens for eggs/meat, and we’re working on our fencing so we can have dairy goats and a cow in the next year. With how much food we go through each week, it’s satisfying to save some money on it, know the sourcing (our own land! ), and have some self-sufficiency in an uncertain world. This is so accurate, Tiffany! We’ve always tried to be frugal with our food budget. Money saved here can be used elsewhere. Then health issues cropped up. Then our three little boys became 2.5 teens (youngest is 11–somedays he eats like a teen, others, not so much). I don’t care what anyone says. No matter how much you think your toddler eats, they DO NOT EAT LIKE A TEEN BOY! The benefit is we don’t waste food. Ever. It is always eaten before it has a chance to go bad. Trying to figure out how much the USDA thinks I “should” spend on food requires a little math manipulation. But it really comes down to buying what is healthiest for our family and finding the best prices on those items. We plan our menus, stock the freezer and pantry when prices are lower, and try to never throw food away. That said, we usually spend between the Thrify and Low cost plans on the USDA chart. And we eat organic meats and dairy plus loads of produce and very little boxed/canned items. Grains are not a major part of our diet either, but beans and potatoes sure are. I wish I could get away with $500, but it simply isn’t possible to do so and eat real food–unless we start keeping chickens (for meat and eggs), beef (for meat and dairy), quadruple the size of the garden and hunt for deer. Of those, the only one likely to happen is quadruple the size of our garden, which is currently over 400 sq feet of growing space. Maybe for the chickens. I agree! Anyone who says their preschooler eats as much as a teenager, has not yet had teenagers. When my teen boy was in sports, he would literally eat 5-6 times as much as my husband did. It wasn’t uncommon for him to eat dinner at the neighbor’s house, go back for seconds, come home and eat a full dinner with us with seconds or third helpings, and still be hungry looking for food an hour later. 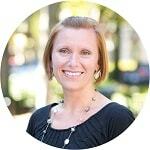 We have 4 boys under 7… This comment terrified me too! Overall I agree that food spending is a very individual thing that no two families can be compared. There are just too many variables to truly standardize a suggested budget. This is really good information. We are trying to scrimp and save in every area we can, but right now we’re not scrimping on food. This is due to my husband and I trying to eliminate some health issues, and real food + juicing is a big part of our healing regimen. Once we’re feeling better, I definitely want to cut back the food budget a little. Whew! I think there are seasons of life for saving money and other seasons where you need to spend more. A focus on self-care is one of these reasons. Currently our grocery budget is 600 with an eating out budget of 150. We usually don’t spend that full 600 though, and it covers our toiletries cat litter etc as well. Personally, I know we could be spending a lot less than this but we’re still trying to get the kinks worked out :). I have over educated myself on the quality of food produced in the U.S. today with the overuse of antibiotics and growth hormones to produce the meats in factory farms..the pesticides, herbicides, fungicides, glyphosates, and what ever else they can throw on the crops of vegetables these days. I don’t think I could even swallow any of this so called food..as close as I can figure we spend about $550.00 per month for two..we shop farmers, farmer markets, CO-OPs, never from the inside of a regular grocery store but only the outer ring..we have our health to show for it but we are seniors on a fixed budget and it gets a bit hard to maintain some months..sure wish the government would stop subsidizing the frankenfood market and do more to support the organic sustainable food system instead so that everyone could eat healthy. We have never been farmers but we are learning to grow our own food and every year we get more out of our garden which is a big help. Our grocery budget is about 11% of our income and we are below the thrifty level, usually between $450-500 per month. Wow, this is encouraging! Our grocery budget currently includes dog food for 2 large dogs, and food and toiletries for my family of 3. We eat gluten free and real foods due to my gluten intolerance and hypoglycemia. We try to eat low carb and Paleo as much as possible, but I have found I do okay with rice, potatoes, and gluten free oats in small amounts. We do not eat beans very often since they upset my stomach a lot, even being soaked. I try to buy cheaper items as organic (like $2 and under per pound) and at least get antibiotic free meats if we can’t afford organic that month. I stretch our grassfed beef with ground turkey throughout as many meals as I can. I always search for items on sale or manager’s special, and when I find them I sometimes change our meals around to accommodate sale items (I usually freeze meats I get on sale). For example, I tried a new recipe the other night, Dairy Free slow cooker Butter chicken (an Indian dish) with chicken thighs I got on sale and my family liked it! I shop Costco, Walmart, online, and try to support local farmers at Farmer’s market as much as possible during the warmer months. We also have a garden planted this spring! We use a cash only system, so when I buy online, I put the cash back into the bank. Cash helps us to stick to budget, as we’re trying to save for a bigger vehicle and to buy land in the next few years so we can homestead. This is really interesting. I spend about $430 (including most household items like toilet paper). Plus we go to the food bank weekly as our income qualifies us for that. That’s about $100 worth, which means we are at about $530. This also includes local milk and half and half delivered weekly (which I love), so I do spend quite a bit on milk in order to have local fresh. I’d love to do more cooking from scratch and probably will more down the road. With a new baby right now that’s hard. Question for you though: my kids eat a ton of snacks. I spend quite a bit on them. I could just buy a bunch of cheap crackers or granola bars, but I choose to provide healthier stuff like fruit, cheese, yogurt, etc. I feel like most of the meal plans I read about online don’t include this stuff, so that adds extra in the budget for me. Any suggestions? This may sound nuts. . . and quite counter-cultural, I know . . . but, we don’t provide snacks in our family. I don’t need more kitchen/dining room clean-up time beyond our meals. My kids each better, healthier meals at our designated mealtimes if they do not have snacks in between. Kids can survive – and thrive – without snacks or grazing throughout their day. By eliminating snacks, I can put more money into quality meat, dairy, produce, etc. for our meals. I gave up snacks and snacktimes when my oldest kids were very small, and we haven’t looked back. 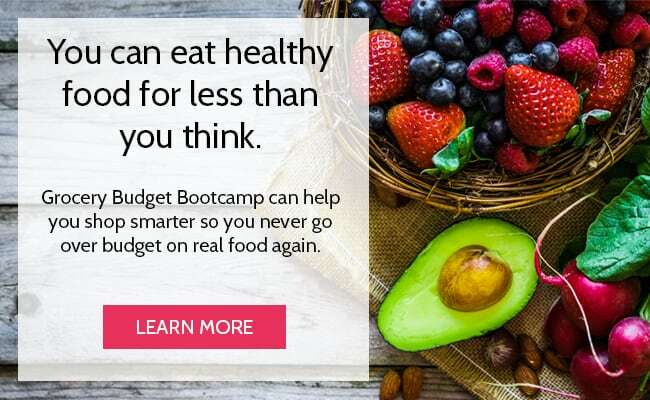 It works for us – and it’s helped our budget and healthy eating tremendously. Probably an unpopular route, but it’s worked for us. That’s not a bad idea. My kids get one snack a day at 3:00pm. We set a schedule for meals. Our lunch is at 12pm and dinner at 6pm so the 3pm snack helps keep the kids sustained until dinner. They get quite grumpy without it! I know this is a really old post, so I hope its ok to comment, but we do an afternoon snack at 3:30, with dinner at 6:30, for my two elementary children. But we don’t keep pre-portioned “snack food” in the house and that is the only snack they get. 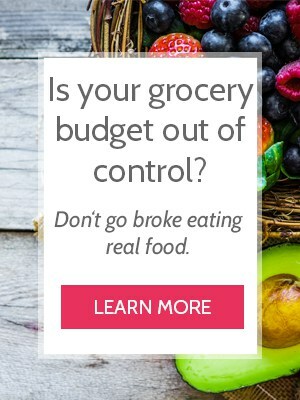 I agree, snacks will ruin a budget and their dinner appetite (which means food is wasted). Thanks for showing were to get information about grocery budgets. I like to check things out myself but links are always helpful. Math is our friend, but we do tend to complicate things more than they need to be at times. Wow, I looked up the charts and figured out that for me, my husband, and our 2-year old, the Thrifty level is $490 per month. Our budget is $225! I think the biggest thing is I buy no meat except occasional bacon. We raise our own broilers and laying chickens, and both hunt deer whenever possible, so all our red meat is venison. We also raise a huge garden and do a lot of canning and freezing. It is still pretty tricky to get by as I am a stay-home mom and my husband is a teacher, whose district has been on a salary freeze for at least 5 years. Our grocery budget is not our biggest worry, really. Our income has been very low while my husband is pursuing a PhD (almost done!!!) so our budget for our family of 5 (3 kids under 7) is $230/month, or about 14% of our income. This includes our toiletries and things like aluminum foil and trash bags. We do get a ton of free meat from grandparents who are shopaholics 🙂 -they fill up our deep freezer every several months, mostly with beef and pork roasts that they find on sale. If they didn’t do that we would probably be spending more like $280. We also garden, and never say no to free food. Boxed snacks are totally out of budget, but we do snack on fresh fruit and veggies and popcorn. We shop at Aldi almost exclusively. Once someone gifted us a Costco membership, but we did not renew because most things were the same or cheaper at Aldi, and we ended up spending more due to impulse buys. So even with a free membership and a few things being cheaper at Costco, it was costing us more. Limiting our shopping to Aldi helps us stay disciplined and stick to our budget, simply due to the limited options. We used to buy a lot of milk, but since switching to full-fat milk we (adults) are satisfied with drinking less! Not buying cereal, which is expensive for what you get anyway, also helps us use less milk. We make a lot of things from scratch -our cooking skills have really blossomed over the past 7 years. It really hasn’t been too bad. I have never worried about us going hungry, which is more than many in this world can say. We’ve succeeded by budgeting, not wasting food, being creative, learning to cook, and of course the free food. I won’t lie though, I’m looking forward to graduation, employment, and a bigger food budget 🙂 I would love to buy local meats and dairy products someday, or maybe raise my own. 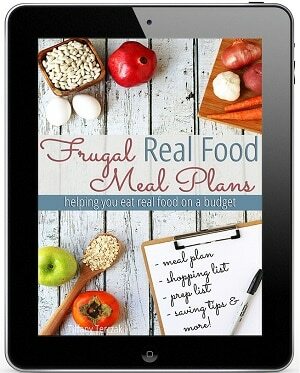 I bought your frugal meal plan book through the homemaking bundle and I actually printed it out and bound it! That’s how much I know it will be used 🙂 the recipes are so similar to how I think and cook. Thank you! I like the open mindedness of your blog! 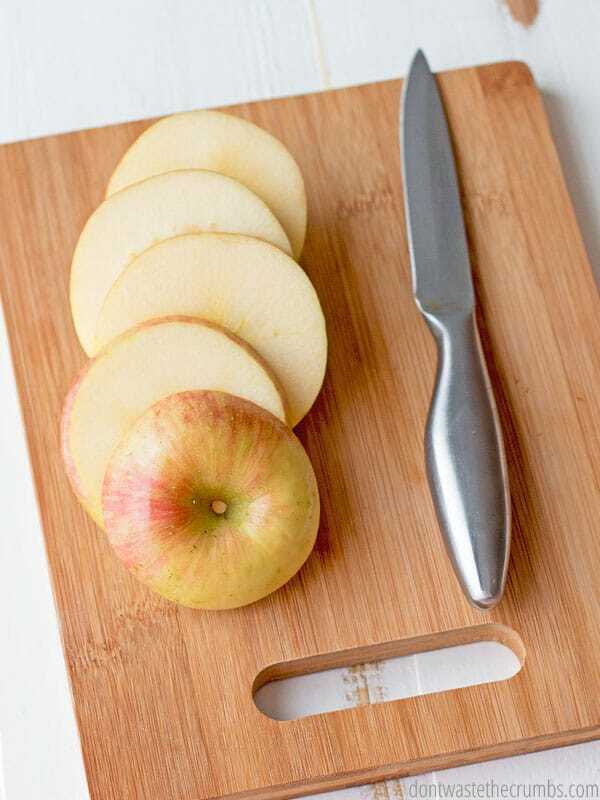 You do a great job on your meal plan. We spend over $800 per month for a family of four. That includes two kids that are 7 and 9 and two adults. I am the main vegetable eater, so meat is a main event for us. I am currently getting most of our meat from a local company and am so fortunate that we can do that. We also get local milk and currently are getting a CSA box. We ate a moderate amount of processed foods, but I am always searching for healthier options. I totally agree that you should do what works for your family. Thanks for all the great tips. Can’t wait to make that ice cream! I just did the math. I spend 35% of our monthly budget on food. And I’m vegetarian. And I don’t by dairy or eggs very often. BOY do I have some homework to do! Family of six. (kids are ages 14-21). It’s just my husband and I. Currently we’re spending $64 a week on groceries. According to the USDA cost of food, November 2016, we should be spending $83.30. Sure we could spend that much buying more and things we don’t need. Would like to spend less than the $64 we’re spending now on food! Thank you so much for providing this information. We have four sons, two of which are teenagers, and two of which have celiac disease and have to be strictly gluten free. I thought our spending on food was absolutely out of control, but this has made me realize I am actually doing pretty well, considering we also do a lot of hospitality and meals for others (like those with a new baby, are sick, etc.). Thank you for helping alleviate some guilt! I am below the Thirfty line and spend only 4% of my income on food (the rest is unavoidable bills like mortgage, insurance, etc). I only eat organic and don’t want to give up on that since I’ve seen the health benefits (haven’t even caught a cold in 3 years). (sidenote: yes, people, it is possible for a single person to only eat organic for $100/month – and I live in Canada, not California). I already do the “price book” thing in my head, but after reading your blog I think I might start doing it on my cell phone to see if I can save even more. I’ve also started my garden earlier this year so that I can have more free veggies sooner and for longer. I found your website while googling “how to save money on groceries”. As you might have guessed I am already pretty frugal, so most articles that came up on google about saving on the grocery bill were already “business as usual” for me (like “don’t shop when you’re hungry”). Your blog, however, is inspiring and motivating. It has real and useful tips. Thank you for writing it. Please continue writing it. I’d love to hear any suggestions on how I can be even more thrifty! Hi Maira! You’ve left an amazing compliment – thank you so much! There are a lot of great tips here on the blog, so feel free to search to your hearts’ content. However, if you have a specific question, feel free to ask and I’ll answer! Thank you for moving forward with this blog. It’s been a tremendous blessing as our family of 6 in California is trying to figure out just HOW we can do this with food and 1 income. Great ideas! I found your site as we had extra white beans in our cabinet and i was searching to find a dessert using up what we already had. Happy to say the blondies were a HIT! That’s wonderful news! We love those blondies too 🙂 Take heart Natalie, IT IS possible to eat healthy food on a budget. It requires creativity, but it can be done! There are other ways to save money. Call other car insurance companies and don’t stay with the same one. Get quotes. I saved money. If you stay with the same one they will increase it every 6 months. Try Liberty Mutual to start. even tho they had pampers chose not to. Landfill is full of dirty diapers. Line dry clothes. I plant a large garden so this year I will be eating a lot of apples and zucchini. I live in the country and plan to get a couple of laying hens next year if my place doesn’t sell. towel will last twice as long. For air freshner in car. Take a clothes pin and put lavender or other oil on it and clip it to your air vent on the dash of the car. It works and no harmful chemicals like those you buy. You need to put in a helpful hints area to your posts. I love people telling me how to be more frugal. I eat healthy fresh food and have lost 30 pounds. I am 66 and feel better and am the happiest I have ever been. Just me and my dog. Thank you ❤️ I, unfortunately, attach a lot of anxiety to my families food choices. I think I’ve been living in fantasy world bc I’m shopping so far above our means. For instance I haven’t bought store bought ground beef in at least a year.. I buy 5 pounds from a local farm for $26 and mix with beans and it usually last me 3 weeks. But I can buy that at my Walmart for $13 😕 I never buy store bought milk, always use butter and I buy Einkorn pasta when possible.